Last week I had the honor of moderating #BYOTchat in the Twitterverse. We followed the #TeachTweet model developed by our colleagues across the Atlantic, #ukedchat. What is a #TeachTweet you ask? It's a series of video experiences on a topic - with reflections related to what you saw, heard or learned discussed through social media (in this case Twitter). A common experience can generate a discourse community (see my last post) and the 5 videos we viewed together definitely generated some discourse! The video format allowed us all to walk the halls of schools incorporating Bring Your Own Technology/Device... hearing from actual, real life students, faculty, administrators. We then used Twitter to discuss, share, reflect and build on our common experience. To see the whole chat - check out the #BYOTchat webpage. Posts linking to videos are in red - helps to point out those Tweets in the midst of all the conversation! 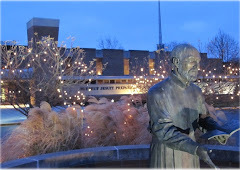 Since this is my personal blog, I will shamelessly promote my less that professional video "Faculty Introduce Bring Your Own Tech at Brebeuf Jesuit" (yes, a long way before I get nominated for a Webby... but a gal has to start somewhere). Why would the cat put a dead mouse in the bean bag? Why can't we touch dead animals? What are you going to do with the body? Humans do not live in a community of one. We live in relationship with others: our families, our friends, our co-workers, and strangers on the street. We create discourse communities based on shared experiences – like dead rodents in bean bags. This dialogue helps all of us reflect on the experience, taking new knowledge forward into our lives. Knowledge accessed via a void, with no dialogue or reflection, at best lives in short term memory, leaving us at a loss when faced with the need to access that knowledge later in life. I have recently read about The School of One and the concept of personalized learning. My concern with the focus on personalize learning to the extreme is the loss of dialogue in shared experiences. Creating a discourse community is still relevant in education today. Learners in a void do not have the opportunity to engage others in shared discourse. This hinders the reflective elements of learning, which encourage new or innovative articulations of thought. I would argue without this opportunity for reflection, for the creation of a discourse community, we are hobbling our students. In her book, “Reality is Broken”, author Jane McGonigal writes of the importance of social connection as element of satisfaction and experience of success. We as humans build “intrinsic rewards, positive emotions, personal strengths by social connections that we build by engaging intensely with the world around us.” (45) Personalized learning privileges the one over the many. While in some cases this may be temporarily successful, the danger of isolation is very real… holding the learner from others with whom valuable reflection and collaboration could enrich the learning experience. Practically applied, this means creating opportunities in our classrooms for learning as community. As educators we can encourage dialogue based on the shared experience of new content (Mitosis to Shakespeare), events (Prom is on the horizon) or skills (Ultimate Frisbee anyone?). Offering our students time to engage each other, working through experiences together, creating communities of discourse is what we do as professional educators. Because that cat is only a year old... and there will be more mice in house thanks to our large wooded lot... retaining this new knowledge is going to be critical.